This private, charming, old world and very comfortable suite consists of 3 rooms: The bedroom with double bed; a full bathroom with a small bath and overhead shower; and a separate kitchen/ study/ lounge area. The Bedroom has a double bed, TV, Heater, Fan, cupboard and mirrors. There is a door from the kitchen to the outside from the kitchen which can serve as a separate entrance. The suite is fully tiled and decorated in neutrals. With its early morning sunshine this is a delightful area suited to single or double occupancy. Consists of 3 rooms: separate bedroom, bathroom and kitchen/study. Ground floor with separate entrance. 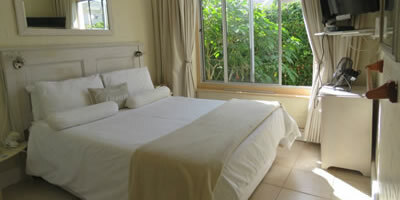 Double bed with white linen and feather pillows and comforter. Bathroom with bath and overhead shower, fluffy towels, gowns and slippers. Kitchen is fully equipped with fridge, microwave, toaster, kettle, mini oven and induction plate cooker, any other plug in devices, and sink. Iron and Ironing board in suite, or use our laundry services.